When to push, when to hold back. When to step in, when to let them go it alone… No matter the outcome. No one said it was a piece if cake. Lately, I feel like there has been a lot of pushing by parents… But they are not only pushing their kids, they are pushing themselves and they are pushing off their responsibilities and then blaming others. There is blame on teachers, blame on coaches, blame on “society” for the pressures put on children. The thing is, I believe this is an easy mentality to fall into. It’s the one where “things” are out of our control. Unfortunately, or fortunately, I was forced into a different reality when my son was diagnosed with apraxia. I HAD to take control. I HAD to take charge and I HAD to be the voice my son didn’t have. Otherwise, the future wasn’t bright. The future wasn’t “hope for the best” and “let the experts figure it out.” I needed open dialogue and positive involvement from the whole team. Then I began to wonder. Why are all parents not this way about their children all the time? For one, its a giant pain in the buttocks. It takes energy. It takes deep intelligent, researched understanding. It takes courage. It takes time. But you know what? THAT is parenthood. Listen. Be involved. Step up. POSITIVELY and regularly communicate. Is it hard? You betcha. But it’s well worth it, I am sure. 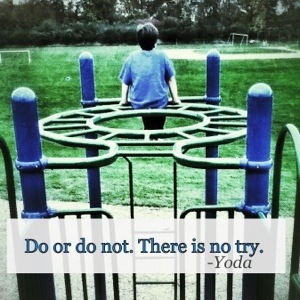 Of course Yoda summed it up perfectly… Do or do not. There is no try. Reblogged this on Patricia Awapara Blog.